Hi guys, I’m sure many of you, among my thousands of readers, were wondering where I was for the past few weeks. Possibly even scared and very concerned about me and my safety. Well, I was sleeping. Now I’m going to share one of my indispensable food tips with you. 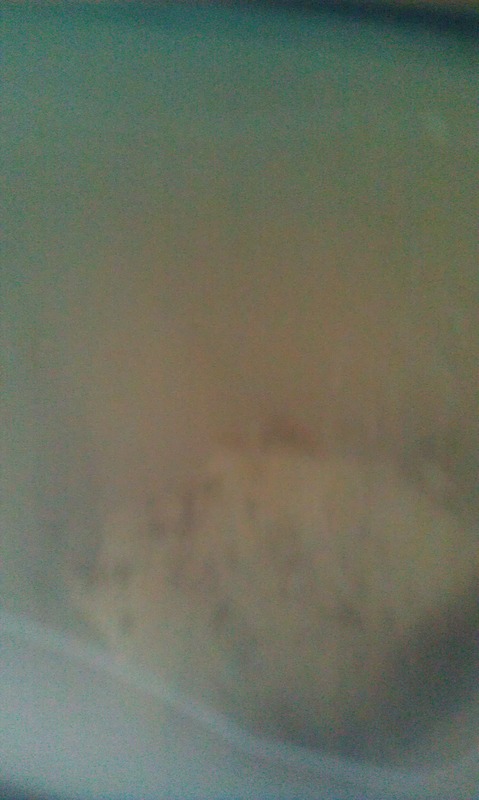 I made myself a frozen pizza last night but due to its size, I could not finish it all by myself. I hate wasting great food, so instead, I put the leftovers in a tupperware container and stuck it in the fridge. 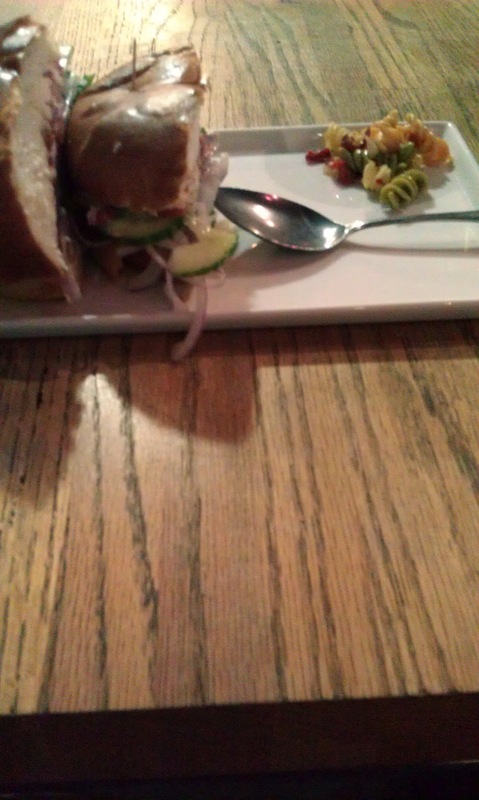 This little guy provided me with a scrumptious appetizer to the sandwich that I had to follow. Since I put it in the refrigerator and not the freezer, it only took me a minute to prepare in my microwave. 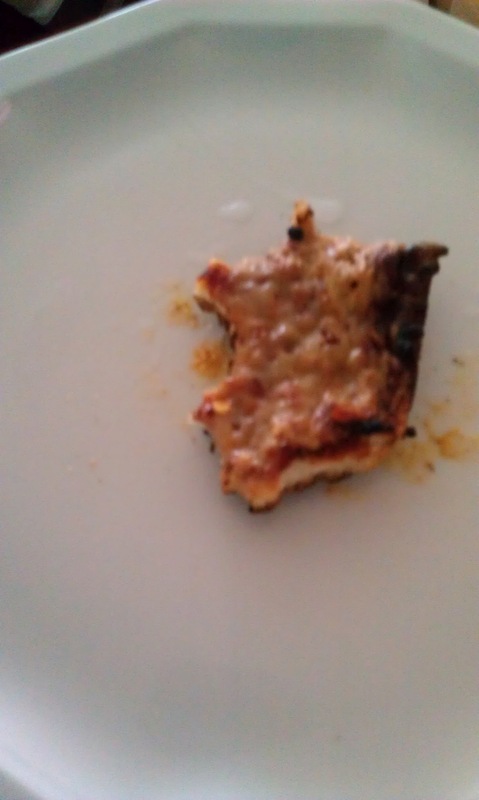 Cooking the piece of pizza in the microwave when it had already been baked in the oven once gave the crust a great texture somewhere in between crispy and soggy. In this way I was able to create a Bagel Bites effect with pizza that was not Bagel Bites. I do recommend their product however. Hi guys, as I was making my sandwich today it occurred to me that I was using one of my favorite deli meats that not only serves to feed me but also to express myself in difficult situations like if someone is lying or if something happened to me that I found unfair. 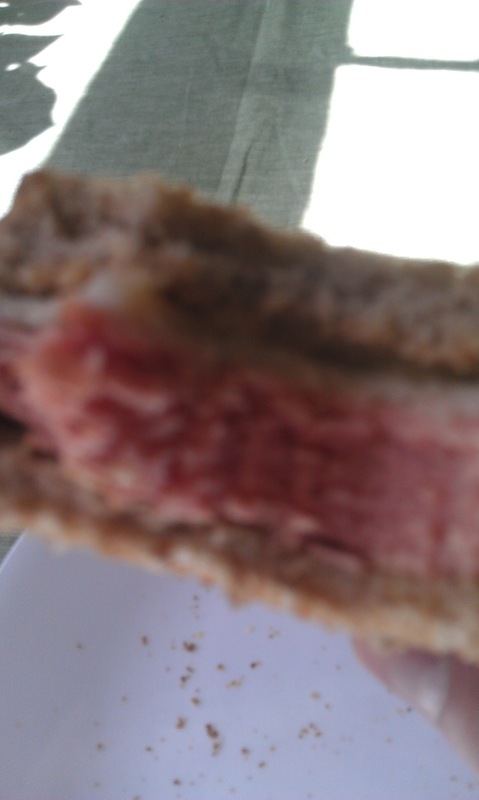 I’m going to show you how to make the advanced sandwich I made as well as discuss some phrases that involve bologna. I broiled two slices of bread and squirt out some dijon mustard on both slices. I smoothed the mustard into a uniform spread by rubbing those slices together, sparing myself the clumsy fiddling around with a knife. 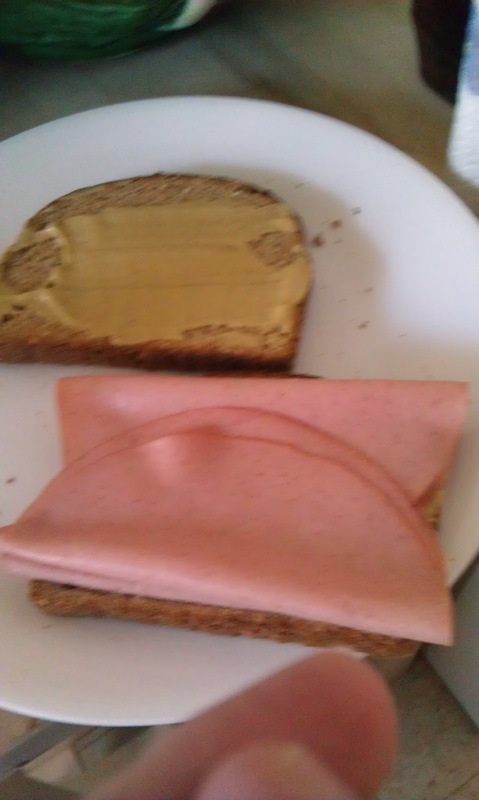 I neatly fold slices of bologna on one half of the sandwich. 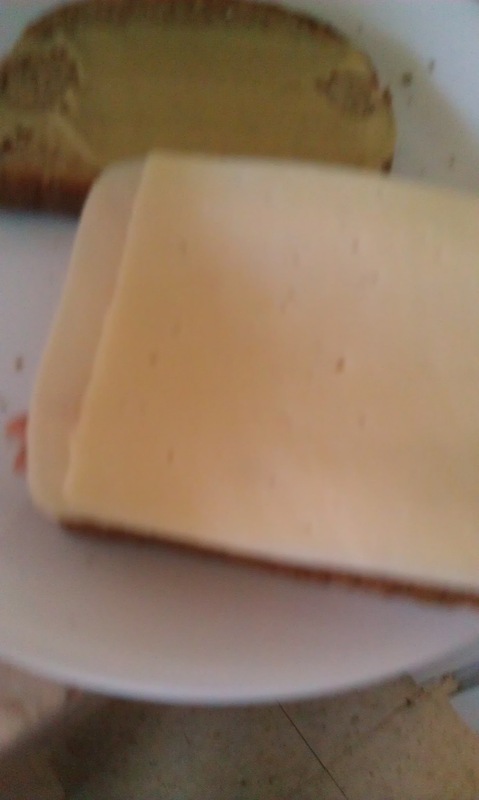 Put two or three slices of cheese on top of the bologna. Keep in mind that bologna isn’t just a meat but like I said earlier, can be used to express some feelings that might be difficult to pinpoint. For example sometimes when people are talking to me they’ll lie or possibly try to deceive me and i don’t want to be confrontational so I don’t say anything to them but in my head I’ll whisper “You’re full of bologna” and I’ll feel a little better about the deceit. If I’m arguing with a loved one or a close friend then I might even say it out loud as long as I don’t think it will have a lasting negative impact on our relationship. Another thing I’ll say to myself sometimes is “That’s a bunch of bologna.” That’s if I feel like I’ve been wronged or treated unfairly but not outright lied to or deceived. Or even just if I’m disappointed about something. Like if I’m riding the subway and they make an announcement that they’re going to skip my stop I’ll says “That’s a bunch of bologna.” Sometimes I’ll say it to another person on the train if I’m feeling good but most of the time just to myself. So really if you’re an angry person think about using these phrases to calm yourself down instead of starting a conflict or confrontation. Just because you’re upset doesn’t meat you have to make someone else upset too. 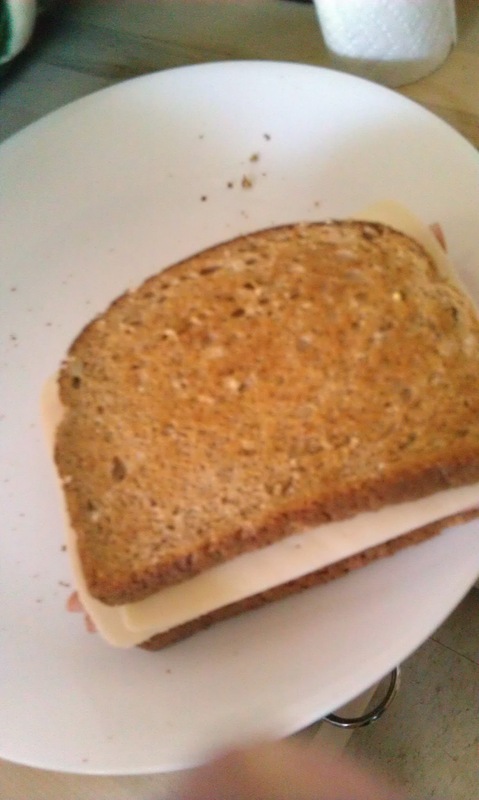 Use a funny phrase with the word bologna to cheer yourself up and when you go home you can look up this post and make a delicious sandwich with bologna to cheer yourself up more. That’s a bunch of bologna in a whole different way!! Stay tuned for some more delicious recipes and information in future posts. I know some Jewish people who are complaining about the lack of exquisite food options at their disposal during the Passover holiday. 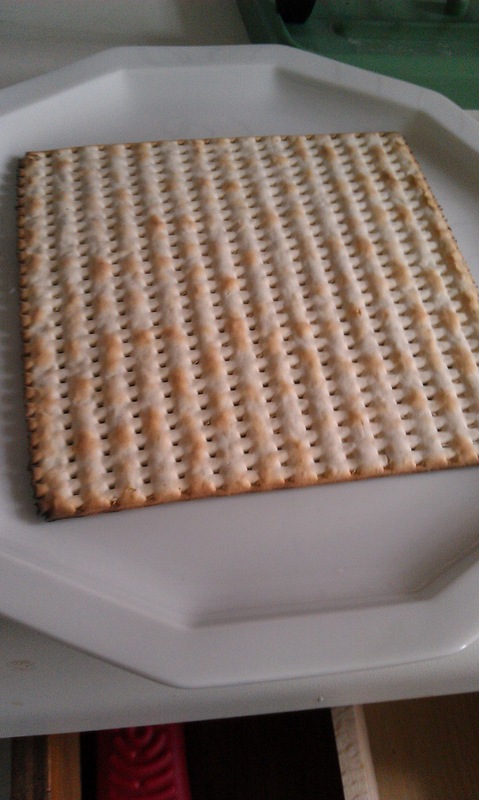 Many of these Jew friends of mine joke about big crackers that they are forced to eat instead of bread. I never back down from a culinary challenge so I set about finding away to make mandatory big crackers delicious. 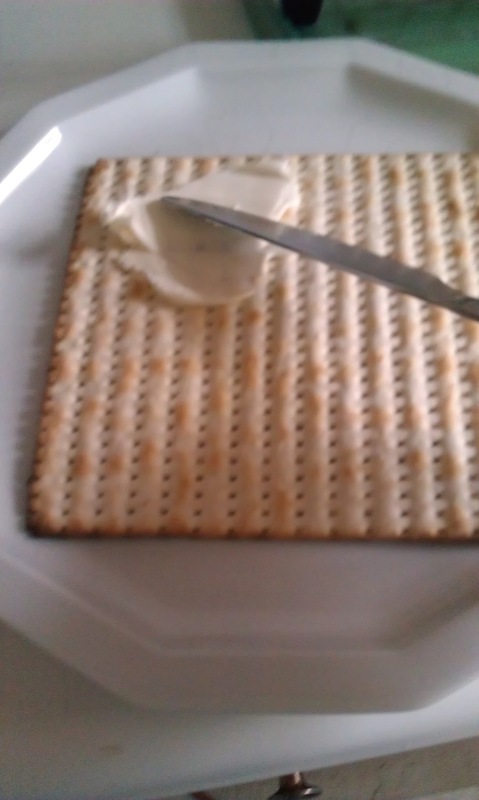 From what I understand, Jews are not used to eating their crackers any way other than plain, as pictured above. 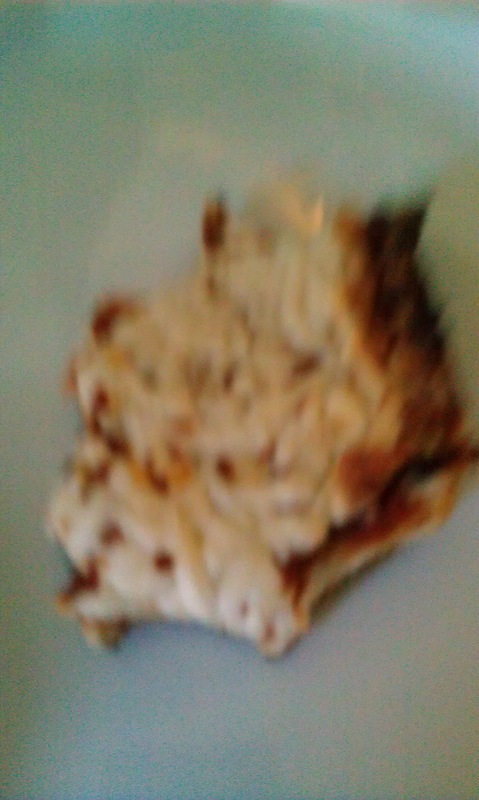 I sampled a piece of cracker as such and it was not satisfactory. 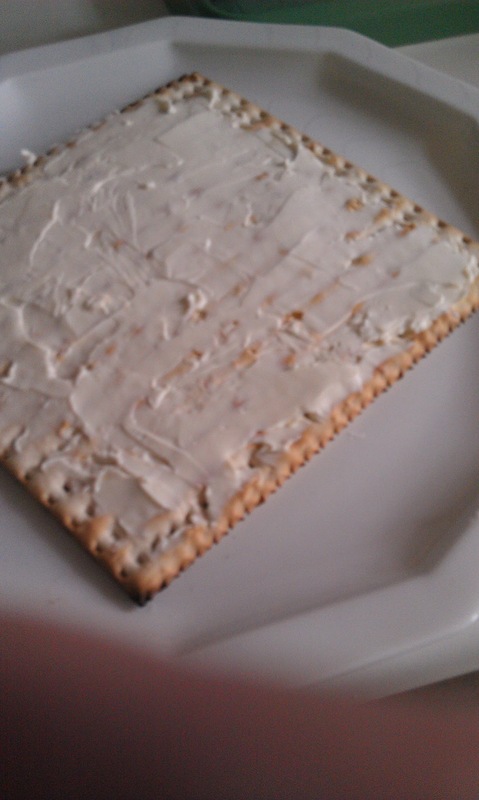 I began to spread cream cheese over the cracker with a knife. I could hardly wait to take a bite of the cracker with the addition of the cream cheese. I wound up with this. A delicious big cracker smothered with light, flavorful cream cheese. Any Jews who are looking for a scrumptious new way to celebrate the journey to Egypt, please replace all meals and snacks with this dish. I just finished eating an exquisite brunch and like always, took plenty of lovely pictures to share with you all so you can attempt to recreate it in your own kitchen or cooking area! 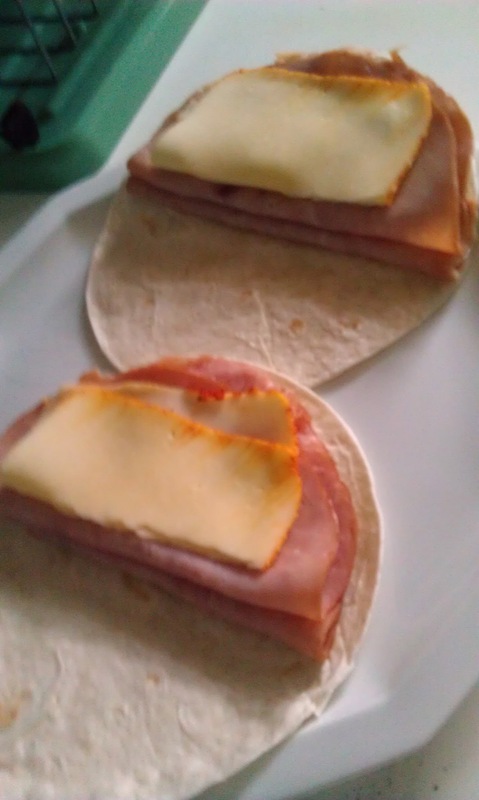 Start with two tortillas, warmed slightly on the stove, with a couple slices of ham and a slice of muenster cheese each. You might think we’re done here, but we’re not. This isn’t just a lunch taco, it’s a brunch taco. 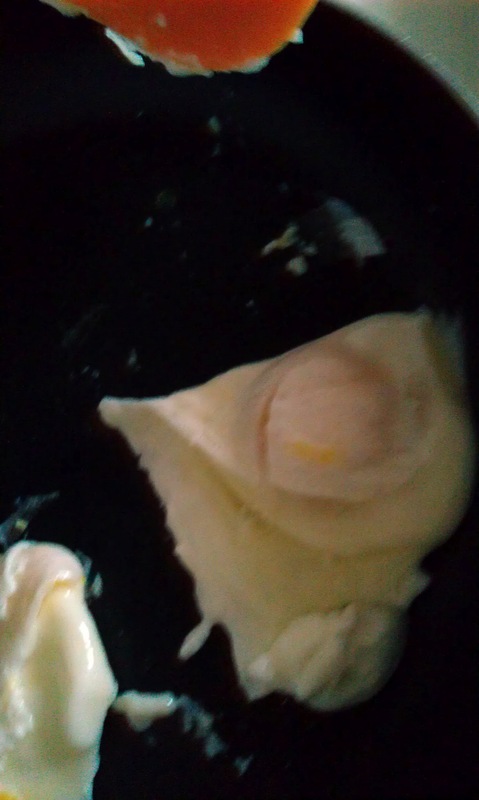 Fry up a couple of eggs. 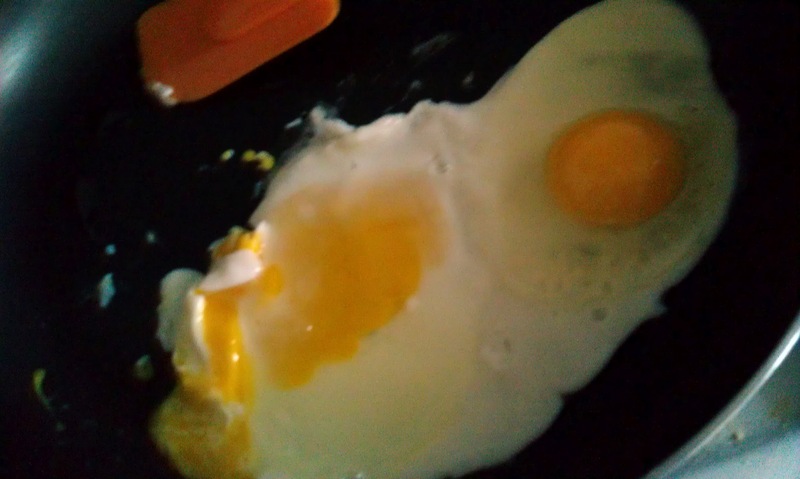 If none of your good spatulas are clean but you have expertise in advanced spatula use feel free to use the kind pictured above, which is not ordinarily used to control eggs. It’s important to package your fried eggs into themselves. 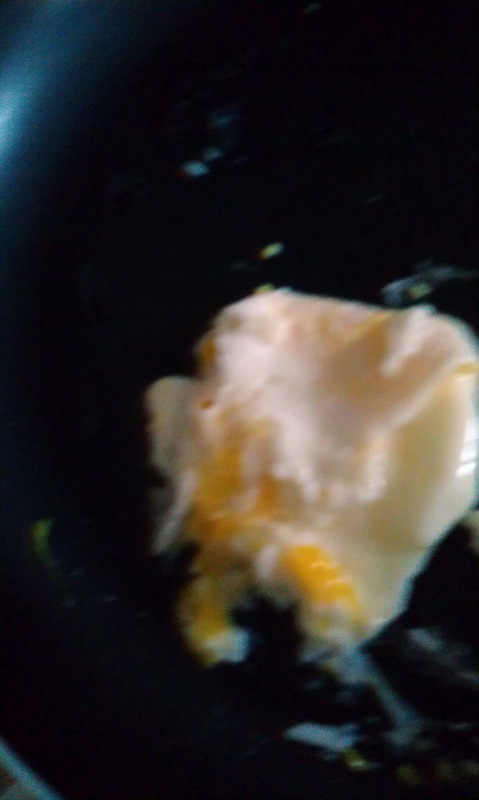 This is a recursive method of cooking that allows the egg to cook in a complete way and assist in the cooking process by trapping heat inside of itself and getting cooked at the same time. This is the most beautiful packaged egg I have ever seen. 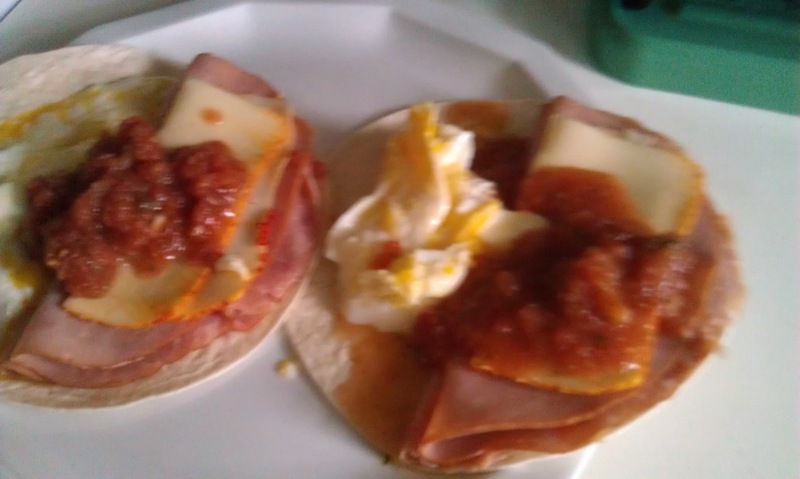 Now breakfast and lunch both have equal representation in our tacos but something’s still missing. That’s right, it’s salsa. We can’t rightfully call it a taco without a single Mexican ingredient. So add some homemade salsa to make it an authentic taco. Serve with a glass of milk and a mug of coffee just like this. If one of your tacos doesn’t stay folded it may require the assistance of your hands. 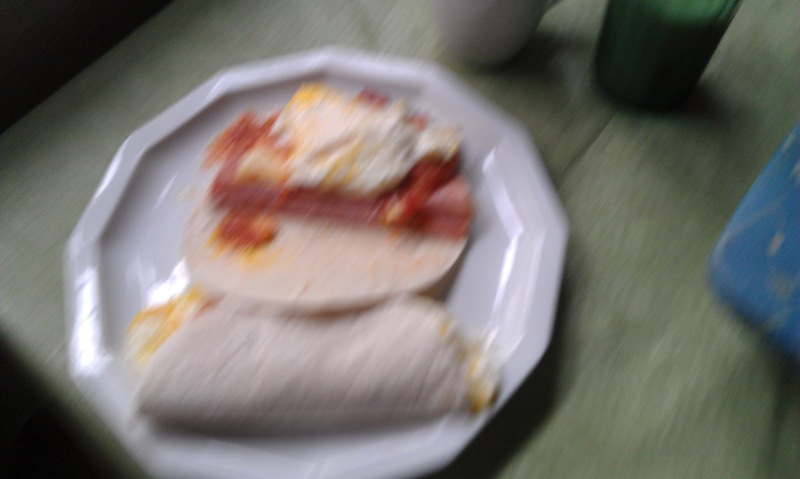 This does not necessarily mean that you assembled the taco incorrectly. 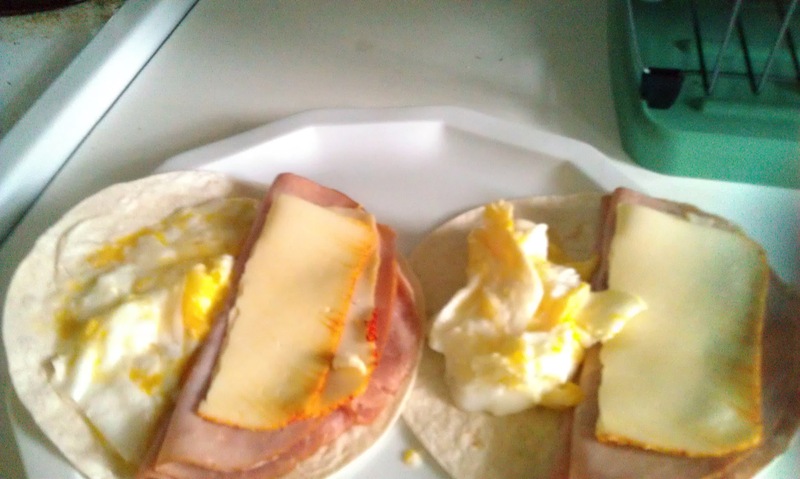 Mine was done perfectly but it didn’t stay folded. I discovered a food product yesterday so perfect and complete in every way that I could barely sleep thinking about sharing it with the web and the general public. 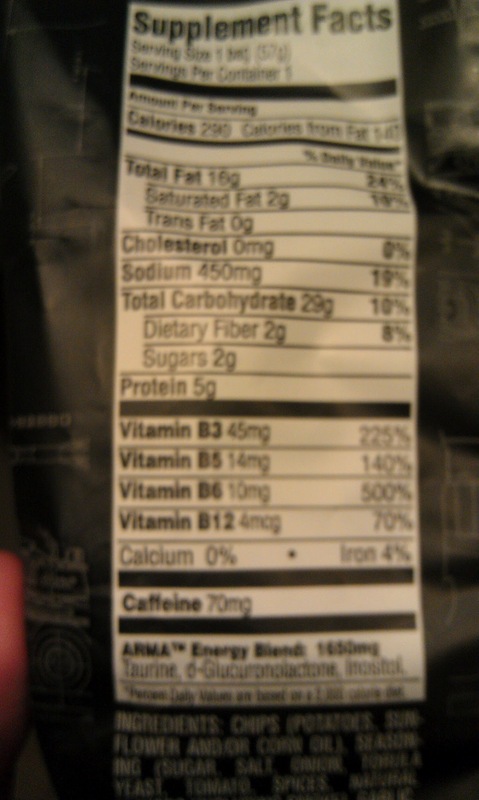 These potato chips are jam-packed with caffeine, taurine, B vitamins and protein. The perfect blend of energy and nutrition to start your day or come out of a slump with a bang. 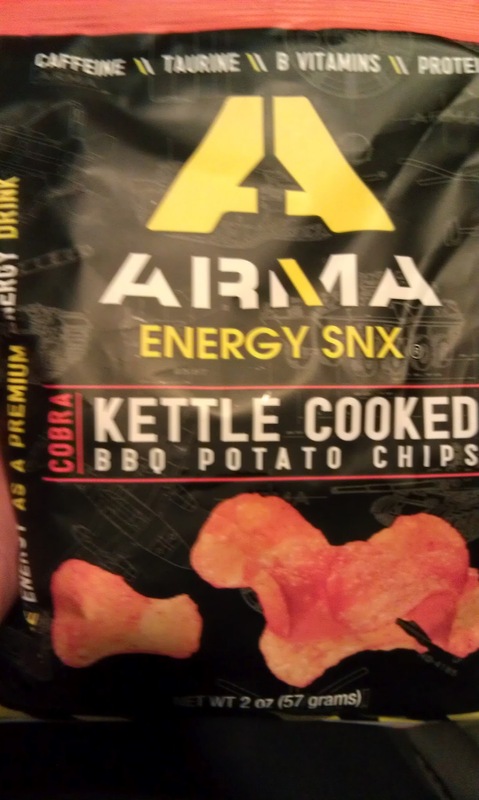 I found a few bags of ARMA Engergy SNX (Snacks) at work and the discovery has changed my life forever. These chips combine the chemicals I need with the delicious crispy crunch of potato chips to make the perfect meal or snack. The chips have a BBQ flavor but with a hint of the added chemicals so that you know you’re getting what’s promised on the bag. The chips maintain form and do not bend or break easily. The reflective mirror-like material of the inside of the bag accentuates the bright color of the chips, like fallen bits of the Sun that rest on top of one another with taurine powder and caffeine powder blended carefully to give you a punch. 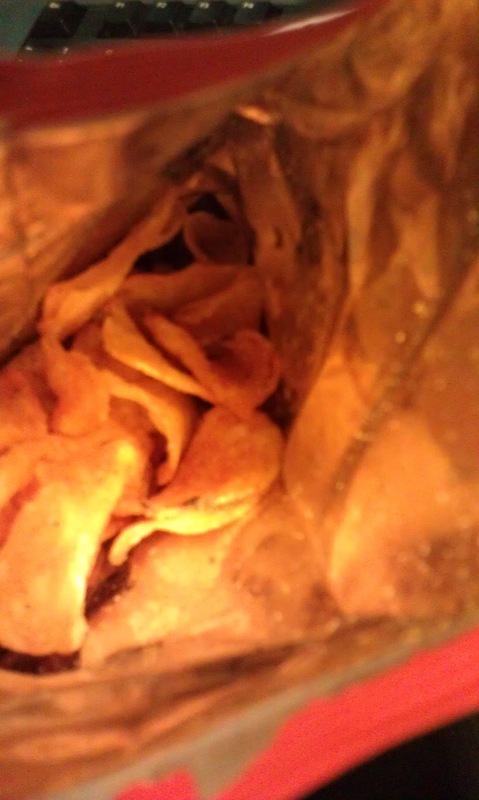 The chips have beautiful curves that you can’t duplicate with homemade potato chips or any other kind of homemade food. Check out these ARMA Energy SNX (Snacks) and make a friend for life, like I did. I ordered a sandwich in a local restaurant and they forgot to put one of the ingredients on. They just left it sitting on the side so I had to get a spoon to eat it. That naked man is named Jason Russell and he’s been in the news a lot lately for trying to give nice Africans guns to fight mean Africans who already have guns. I don’t know why he freaked out like that but he needs to read this post and CALM DOWN with a nice cup of relaxing tea. This recipe is for an advanced drink and you should make sure you’re comfortable working with hot liquids before you attempt it. 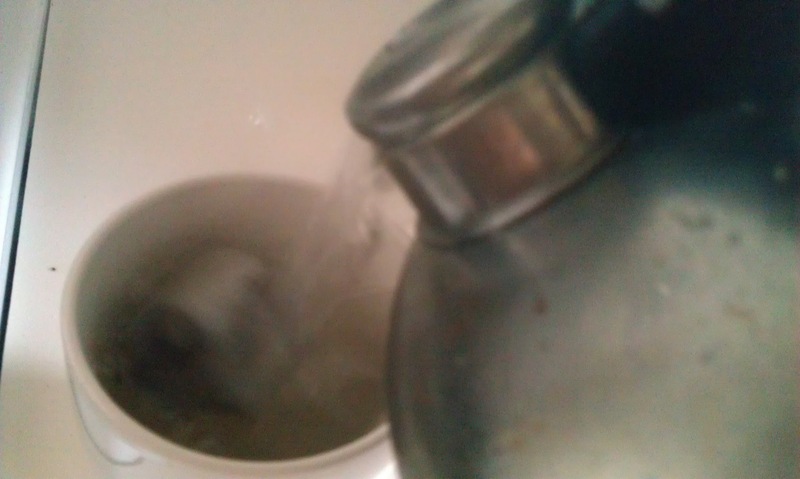 Begin by filling up a teapot, kettle or water heater or hot plate with some cold water. The water does not have to be hot at this stage in the cooking process because we are going to heat it up with another kitchen tool. 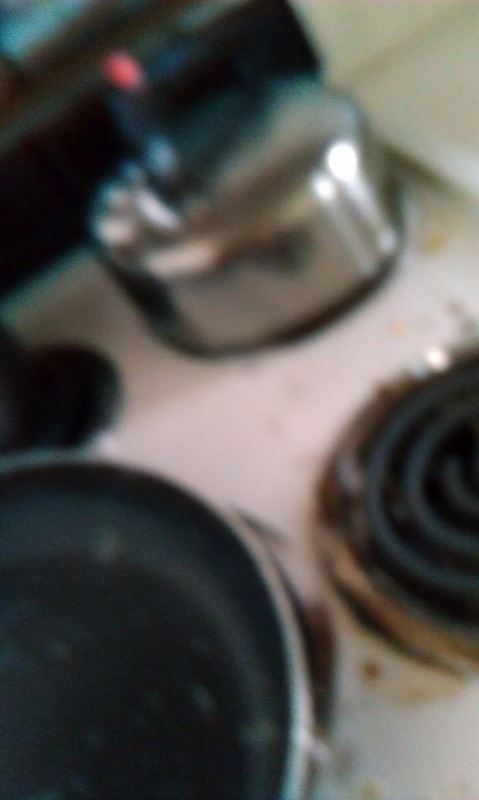 Place the teapot on one of your stove’s back burners. This way, if you decide you want to cook some eggs or perhaps something else in the meantime, your front burner is easily accessible. Turn the burner on and put it on the highest setting. 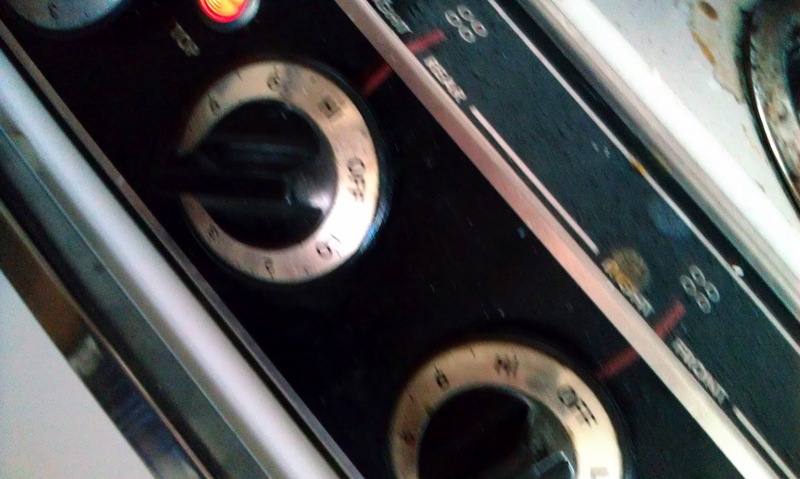 My luxury stove clicks when it’s turned to hi to alert me that I’m on the highest setting. If your stove doesn’t have this feature and you don’t feel confident in determining the highest temperature by yourself, don’t feel bad about putting this beverage off until you’re a better chef. When the kettle gives a toot it means it’s boiled and you’re just about ready to drink some tea. 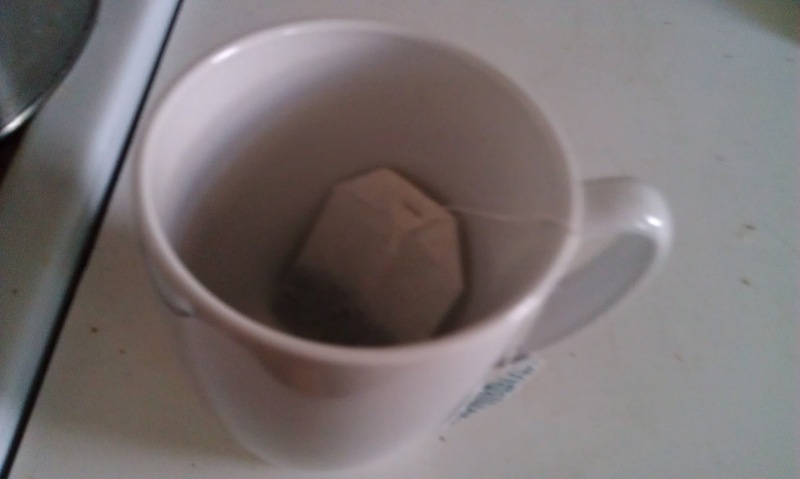 Put a teabag inside a mug of your choice and make sure the string is dangling on the outside of the mug. After pouring the boiled water into your mug, your tea is done. Try to drink it quickly because it does not taste good cold. 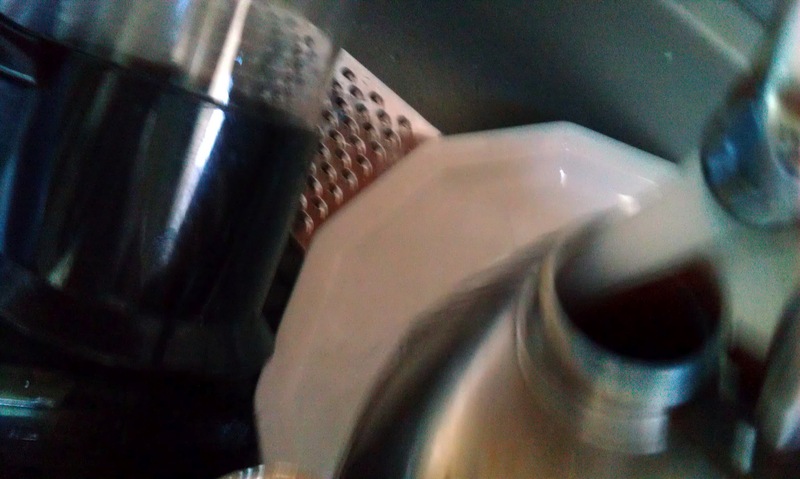 When you finish your first mug, your teapot will still probably be hot enough to provide for a second cup. Don’t drink too much if you have to go somewhere important because you will have to use the bathroom a lot.